This project identified a number of strategies to reduce pathology costs and clinical variation in the testing process, including enhancements to the patient’s Electronic Medical Record (eMR), development of best practice guidelines, staff education and improved reporting mechanisms. To reduce the costs associated with unwarranted variation in pathology testing at four sites in Western NSW Local Health District (WNSWLD), by 10% within 12 months. Reduces unwarranted clinical variation between sites. Improves evidence-based pathology ordering practices. Improves clinical decision making, resulting in improved patient outcomes. Reduces costs associated with pathology tests and processes. Improves the quality and safety of pathology tests, by reducing avoidable testing. Educates staff on best practice in pathology ordering. Unwarranted clinical variation is defined by the Australian Commission on Safety and Quality in Health Care as variation that cannot be explained by the condition or the preference of the patient; it is variation that can only be explained by differences in health system performance1. Research suggests that in Australia, clinical variation is a growing problem2, 3, 4. Traditionally, pathology tests comprise a full vial of blood that is sent to the lab for processing. However, new technology has allowed Point of Care (POC) testing to be implemented in many facilities. This involves placing a small amount of blood onto a reagent cartridge and processing the result at the bedside, which is a more efficient and affordable solution. In 2015, annual budget allocation negotiations at WNSWLHD identified rising costs at its four procedures sites (Cowra, Forbes, Mudgee and Parkes Health Services). An internal review of pathology data showed that pathology ordering had increased by 6% over a six-month period to December 2015, while expenditure had increased by 9% compared to the same period the previous year. These costs were a result of clinical variation across the four procedural sites. A review of pathology charges was undertaken in April 2016 to find the underlying cause of the clinical variation. It was determined that call-backs were the main cause, which is when a facility asks a pathologist to return to the facility after hours, to perform formal testing on blood samples. It was determined that reducing call-backs and encouraging POC testing across all four sites would reduce clinical variation and associated costs. The following solutions will be implemented in 2017. Guidelines on when a formal pathology review is required (currently in progress with key stakeholders). Enhancing electronic medical records to prevent repeat testing and support best practice ordering (currently in discussion with key stakeholders). Development of call-back guidelines to support clinical decision making. Workshops with nursing and medical staff to educate them on the benefits of POC testing. Development of a reporting suite to monitor POC testing use, pathology call-backs and orders (discussions in progress with Pathology West). Enhancing the suite of available POC tests to include white cell counts (now available, to be rolled out to all sites by end September 2017). Development of best practice ordering guidelines to encourage responsible, appropriate ordering. A process for reviewing the appropriateness of pathology ordering. learning outcomes achieved by staff following education workshops. Access to quality data for diagnostics and ongoing monitoring is critical to the success of the project. It’s important to develop and maintain strong partnerships with key stakeholders. Verstappen WH, ter Riet G, Dubois WI et al. Variation in test ordering behaviour of GPs: professional or context-related factors? Family Practice 2004; 21(4): 387-95. National Coalition of Public Pathology (NCOPP). Encouraging quality pathology ordering in Australia’s public hospitals. Final Report. Canberra: NCOPP; 2012. Georgiou A. 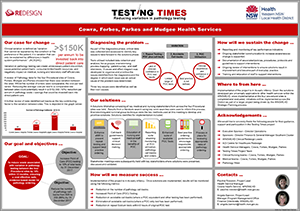 Evaluation of NSW Health Pathology Point of Care Testing – A study of selected sites in Far West, Murrumbidgee and Western NSW. North Ryde: Macquarie University; 2016.